The start of something new? Image via Twitter. Donald Trump fashions himself a truth teller. That is, of course, fairly difficult to do when Politifact named “the campaign misstatements of Donald Trump” its lie of the year for 2015. Due to this, and Trump’s penchant for denying things he said only days before, media outlets have struggled to realistically fact check him, all the while covering his every move. Consider Trump’s Supreme Court short list. By all accounts, the names on this list are all candidates that conservatives can be extremely satisfied with. However, the next day, Trump was already backing away from the list he released, and said that he might pick someone who is not even on the list! If Trump can’t even be held accountable to words that are written down, you can bet he can’t be held accountable for what he simply says. It turns out that he can. Back in January, Trump skipped a GOP debate in Iowa for an event to raise money for veterans (which is of course, a noble cause). He assured us all that he raised 6 million dollars, and that he himself donated 1 million. His campaign put out a statement on January 28th saying that “Mr. Trump personally contributed $1 million dollars to the cause.” That sounds pretty definitive to me. However, of course that turned out to not be the case. In February, veterans charities told reporters that they had not received any of the money. Trump listed 22 organizations that he would donate to, and when 13 were contacted in February, 9 had not received a cent. In fact, he waited five months to donate. CNN also found a way to complement the Post’s actual fact-checking of Trump, by simply pointing out the obvious. Trump worried many when he expressed a willingness for Japan and South Korea to potentially acquire nuclear weapons, which he of course just recently denied. 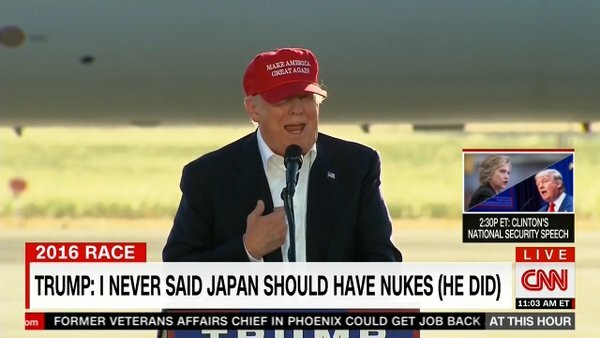 CNN therefore decided to try something new, and correct him real time. The results speak for themselves. The Post decided to actually take a deep look into how Trump’s words compare with his actions (unfavorably) and CNN decided to actually point out that Trump is lying, in the midst of their coverage of his campaign. Next Next post: The First House Republican To Lose?